Colored Lens filters promise creative Nashville outdoor lighting. Many times, our stories serve as a way to convey the benefits of outdoor lighting to homeowners who do not have existing outdoor lighting. We are pleased that we can serve as a reputable and informative source about all genres of outdoor lighting. We also feel it is important to keep our existing outdoor lighting customers informed of ways they can implement their systems to gain the most enjoyment. Colored lens covers are a great example of a simple way to add drama to your existing landscape lighting for a special event, occasion or just to change the mood in your landscape! 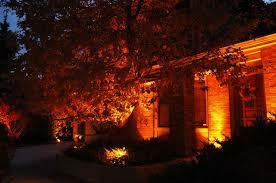 Lighting Effects with orange lens covers, photo courtesy of Outdoor Lighting Perspectives of Colorado. 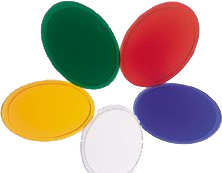 Multi-color acrylic lens covers are available through Outdoor Lighting Perspectives of Nashville that simply install over your existing well lights.These vibrant lens covers are available in green, red, dark blue, light blue, amber, purple and orange. In addition, colored lens covers are also available for spotlight fixtures and colored LED bi-pin bulbs are available for path lights. Not only can these versatile lens covers enhance the festive mood in your landscape, they work great when used in conjunction with other genres of holiday outdoor lighting. 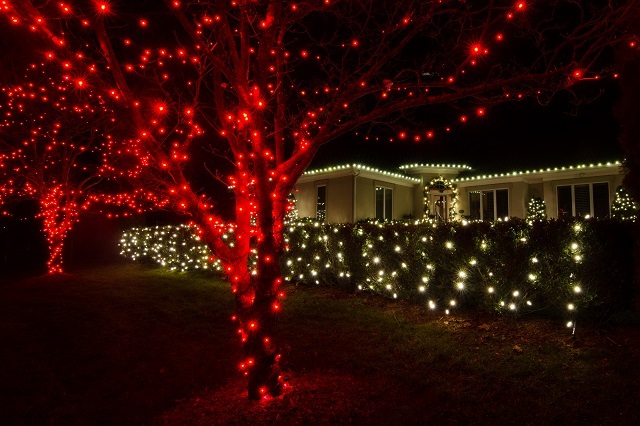 This lighting amenity speaks well to homeowners who love the use of festive color in their home during the holidays, and aren’t afraid of using color in the landscape. Red lens covers help welcome the holiday season. Photo courtesy of Outdoor Lighting Perspectives of Colorado. Since these covers come in a myriad of colors, they are easily interchangeable on a whim. Orangem amber and purple work great for celebrating Halloween. Orange would also reflect a show of support for the University of TN football! Red and green work great for Christmas, blue works great for Hanukkah and also to show support for the Titans on game day! The list of possibilities and creative ways you can use these lens covers to show off your distinct style is truly endless! 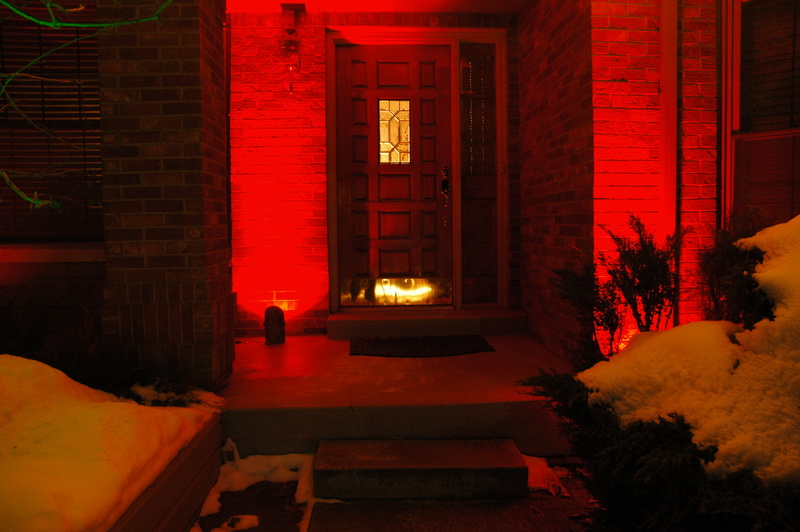 This entry was posted in Christmas Lighting, Halloween outdoor lighting, Holiday Lighting, Holidays and special events, Landscape Lighting, Nashville Christmas Lighting, Nashville Holiday Lighting, Outdoor Lights Nashville and tagged Adding lens covers to your Nashville landscape lighting, Blue lens covers for Nashville landscape lighting, Colored lens covers are a great example of a simple way to add drama to your existing landscape lighting, Colored Lens filters promise creative Nashville outdoor lighting, Colorful Nashville Holiday Lighting., Creative ideas for your Nashville landscape lighting, Creative use of color in Nashville outdoor lighting, Green lens covers for Nashville landscape lighting, LED holiday lighting Nashville, Lightscapes of Nashville, Multi-color acrylic lens covers are available through Outdoor Lighting Perspectives of Nashville, Nashville Christmas Lighting, Nashville landscape lighting, Nashville Orange lens covers for landscape lighting, Nashville red lens covers for landscape lighting, outdoor lighting Nashville, Outdoor Lighting Perspectives of Colorado, Outdoor Lighting Perspectives of Nashville, Purple lens covers for Nashville landscape lighting, Tennessee Titans, Unique Nashville holiday outdoor lighting, University of Tennessee, University of Tennessee Football by outdoorlightingnashville. Bookmark the permalink.